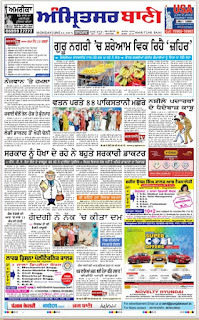 In the early eighties and nineties when the Govt was fighting the Khalistani youths who had risen against the Govt for carrying out Operation Blue Star and Sikh Massacre of Delhi the Govt agencies curtailed the press freedom. Initially it was done by Indian Army in the wake of storming of Golden Temple under the code named Operation Blue Star. 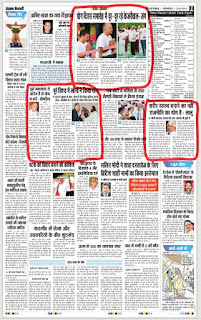 The army had terrorized media to such an extent no journalist raised voice for freedom after the media-men were acclimatized to gaging of press freedom. Slowly the police took over this duty from army. Afterwards came the days when the militants were getting their statements published and simultaneously the obituaries or the bhog ceremonies of the killed militants were routinely being published. 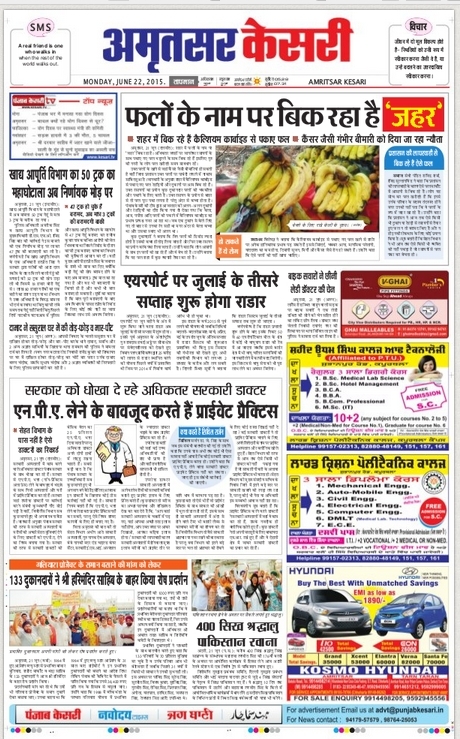 While the radio and TV were exclusively being run by the Govt itself the free media was newspapers only. 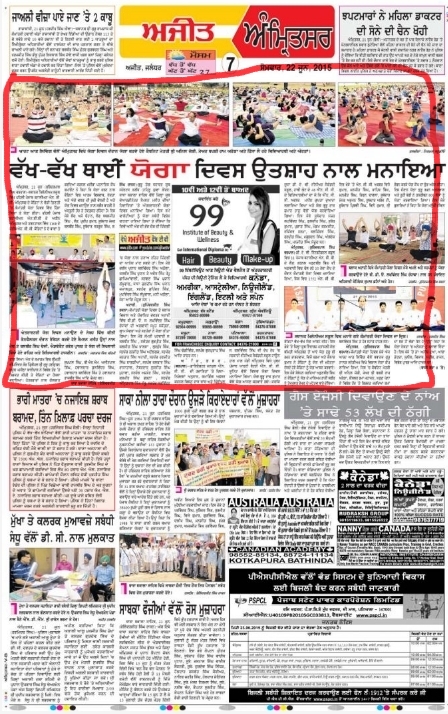 Basically there were 3 groups publishing newspapers namely; 1.The Tribune group which had its Punjabi and Hindi editions in addition to the main English paper. 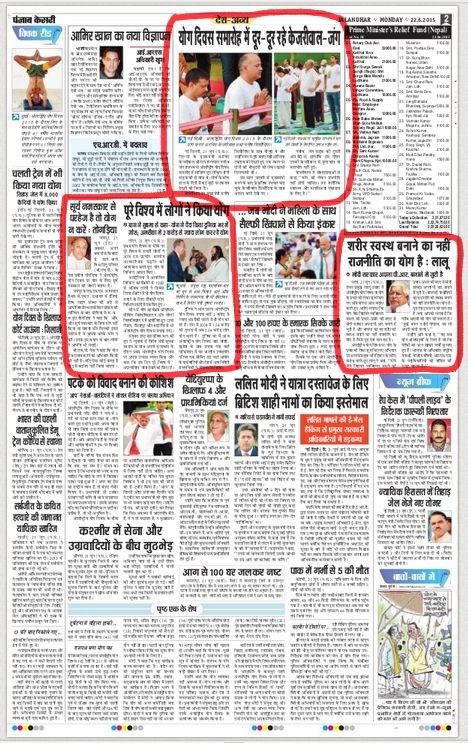 The Govt had no problem with this paper because it was being run by pro-establishment people, 2. was Hind Samachar Group (publisher of Hind Samachar (Urdu), Punjab Kesri (Hindi) and Jagbani (Punjabi) which was deadly opposed to the militants. 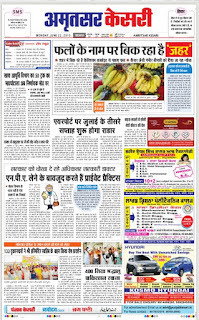 Two of its editors had been killed by the militants. 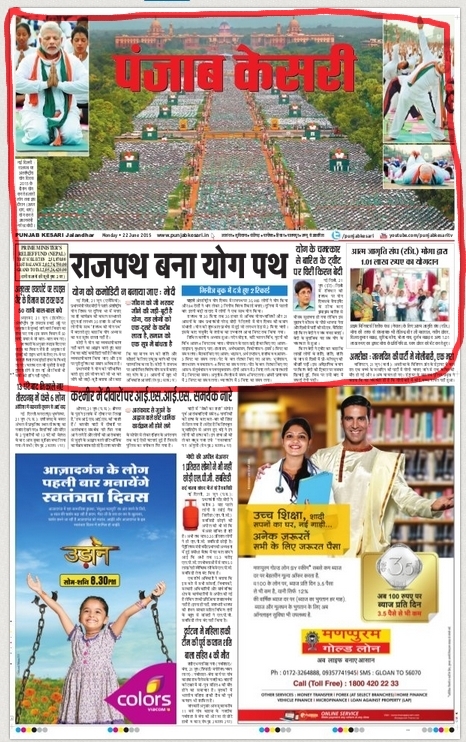 Thus there was no problem either from this paper to the Govt. 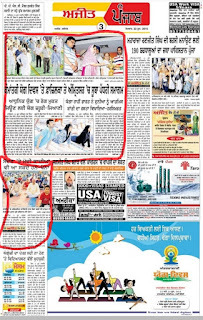 The concerned Govt agencies were voluntarily getting information from this group and the 3rd was Ajit Group the publisher of daily Ajit in Punjabi which was considered as the Sikh paper. In fact both Ajit and Hind Samachar group were basically responsible for Punjab of that day. Both were commercially opposed to each other and both promoted communalism often commenting on each other every day. 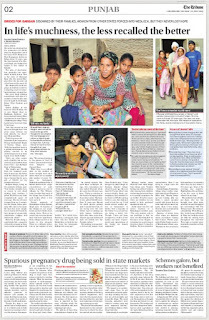 The Govt's thus entire focus was Ajit which they believed was the mouth organ of the Sikhs and thus militants. 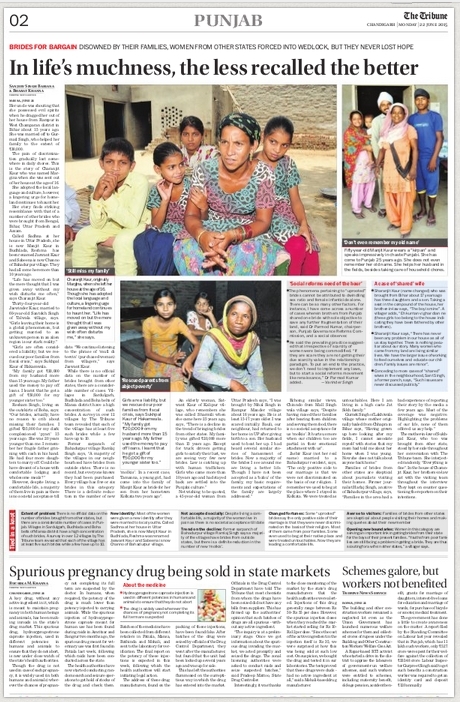 We suspect the Govt agents infiltered into the editorial of the paper. 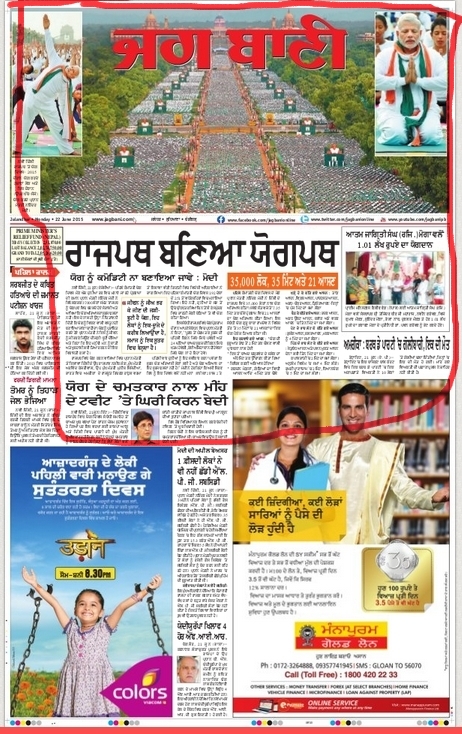 The result being planting of pro-Delhi news in the paper and distortion of language to make it just a dialect of Hindi. 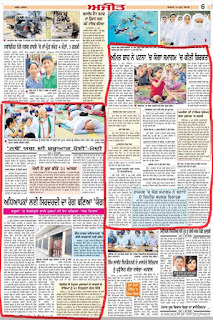 Recently the Hindu conservative party BJP announced countrywide programme of Yoga classes on June 21. 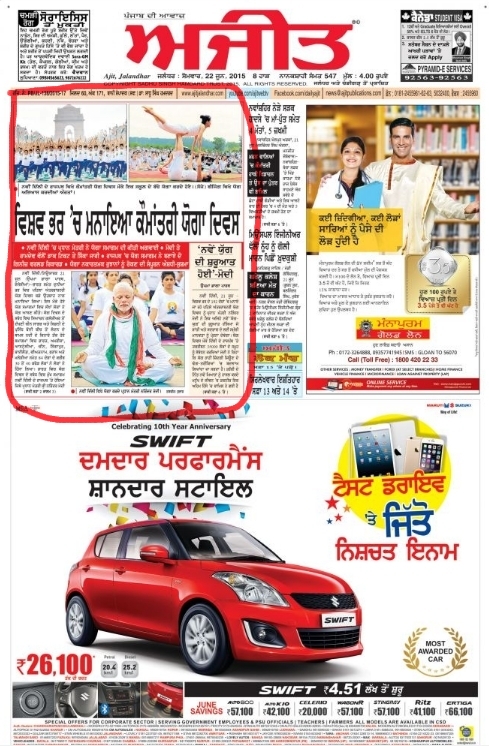 However Sikh political party the Akali Dal refused to be part of the communal Yoga programme of BJP. They refused to open the schools which were enjoying summer holidays. The education minister categorically refused to order the schools to participate in this programme in view of holidays. 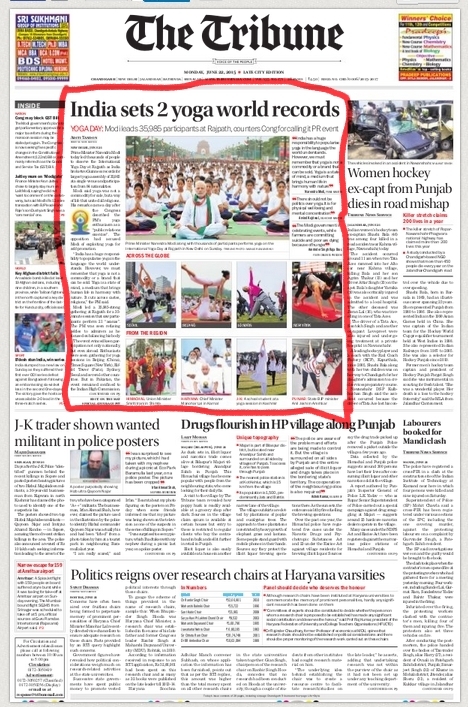 The BJP leaders felt humbled as far as Punjab was concerned sending a note of embarrassment for the Central Govt that the Sikhs were not participating in the mega-Yoga event. 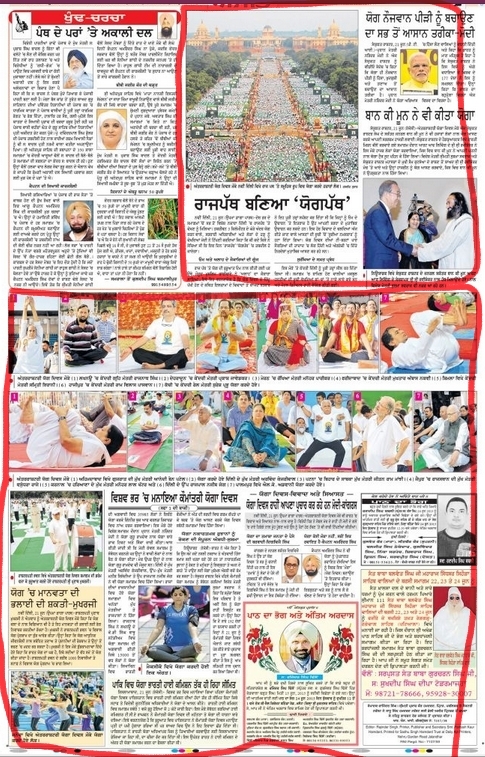 To prove that Punjab was no different from other states the Central departments were insisted upon to take part in the Yoga programmes in their respective areas. 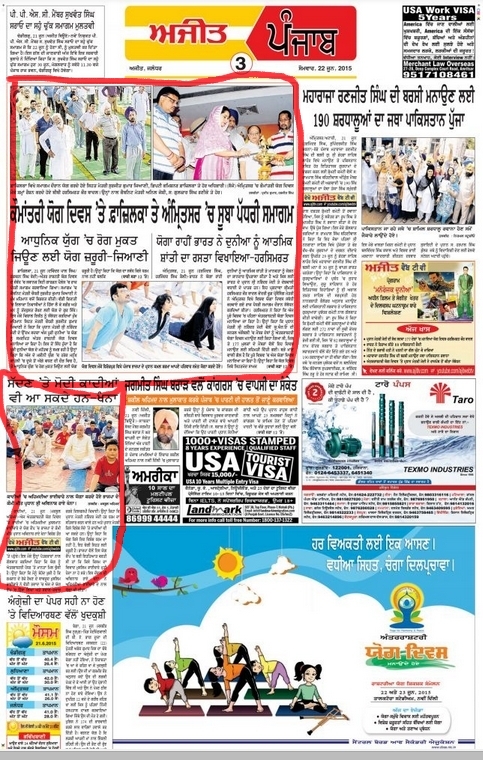 But the agents felt that media coverage was more important than the actual celebration of yoga event. 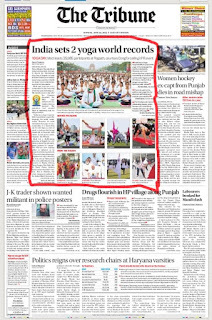 We suspect Ajit paper was ordered to afford maximum coverage to Yoga exercises and it happened. Now look for yourself. 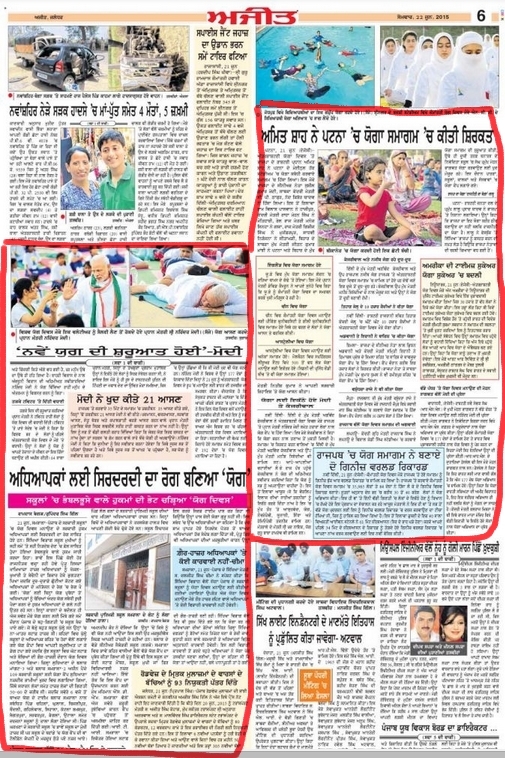 For comparison we are reproducing prominent papers of the region with their respective coverage of the yoga event. 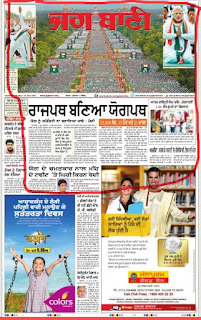 You will find Ajit the Sikh paper has given about 10 times more coverage than the other papers whereas the fact is the Sikhs didn't participate in the event. 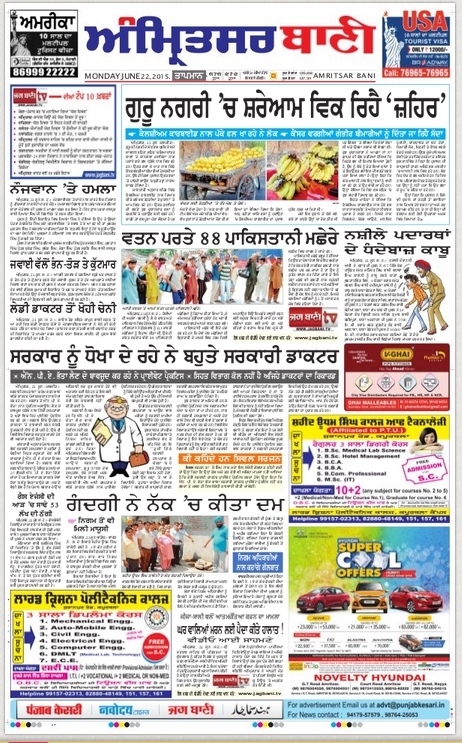 It shows all is not well with the Sikh news paper. I don't know how far it is correct but the rumour is that the owner of the paper is subject to blackmail and exercises free hand only in the financial matters. 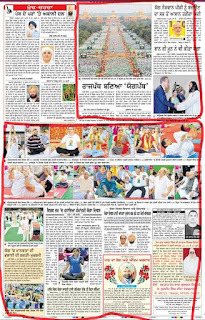 It is rumoured that the reporters were instructed to send maximum reports on yoga event on that day. 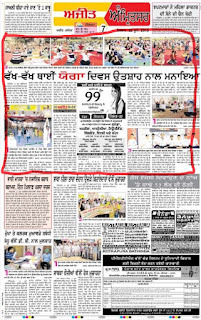 It is rumoured that the editorial management of the paper is in the hand of Govt agencies since the ending years of eighties. 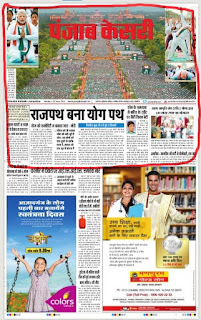 Are we living in the 21 century where the condition of media is that pitiable?